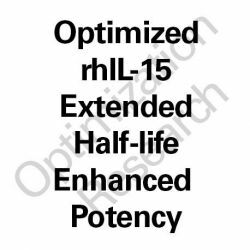 MOD-rhIL-15 is a single amino modified (proprietary) rhIL-15 peptide that foster enhanced potency and half-life of 125% and 190% respectively. The protein encoded by this gene is a cytokine that regulates T and natural killer cell activation and proliferation. This cytokine and interleukine 2 share many biological activities. They are found to bind common hematopoietin receptor subunits, and may compete for thesame receptor, and thus negatively regulate each other's activity. The number of CD8+ memory cells is shown to be controlled by a balance between this cytokine and IL2. This cytokine induces the activation of JAK kinases, as well as the phosphorylation and activation of transcription activators STAT3, STAT5, and STAT6. Studies of the mouse counterpart suggested that this cytokine may increase the expression of apoptosis inhibitor BCL2L1/BCL-x(L), possibly through the transcription activation activity of STAT6, and thus prevent apoptosis. A dose of 20mcg to 50mcg administered b.i.d for alleviation of severe cachexia, tumor inhibition, and immuno/inflammatory-based conditions is anticipated to have sound results. for research geared toward myotrophic/anabolic and anti-aging related target goals. The Acceptance and Necessity of A Modified Interleukin-15; A Novel Non-Hormone Anabolic & Powerful Synergist of IGF-1. Interleukin-15 is a complex cytokine (with structural similarity to IL-2) and growth factor that plays a huge role in skeletal muscle health and immunological responses. IL-15 binds to and signals through a complex composed of IL-2/IL-15 receptor beta chain (CD122) and the common gamma chain (gamma-C, CD132). IL-15 is secreted by mononuclear phagocytes (and some other cells) following infection by virus(es). This cytokine also induces cell proliferation of natural killer cells; cells of the innate immune systemwhose principal role is to kill virally infected cells. It was discovered, cloned and characterized in 1994; being identified in human cultures/tissues and since then has been the subject of many important research advancements due to it's progressively astounding ability to impact many venues of human health(1). It drew much attention in 1995; wherein an endocrinology report demonstrating it's application in skeletal myogenesis and myoblast proliferation, led to it ultimately being seen as a novel and potent non-hormonal anabolic "growth factor"(2) (3). Continuous research also revealed INTERLEUKIN-15; to enhance immune responses and allow cells to more effectively battle the malaria virus, as well as other invaders/pathogens(4)(5). A 2011 study also elaborated on IL-15's ability to increase system t-Cell responses against foreign and abnormal cell collections, it was able to mediate an increased response to T-cell lymphomas and thus was seen as being a possible candidate for cancer research and treatment(7). It is also extensively being studied in autoimmune conditions such as multiple sclerosis and in inflammatory bowel disease - where it shows some promise in alleviating these conditions, at least partly, or in some instances, in combination with other treatments(9). As a further confirmation, IL-15 was again shown to have anabolic and myotropic effects in skeletal muscle - in this particular study - revealing the mechanism of action being antagonizing/halting proteolysis in muscle cells/tissues. As a result of growing interest around this cytokine, and optimistic scientists in many instances recanting or bringing up IL-15 as a highly symbolic reference amongst anabolic research(10) (11), especially given the incline and attention to muscle wasting disorders, forumer's and fitness enthusiasts have taken further discussions regarding IL-15, under their wing and in highly popular threads(12)(13). Certainly, and unlike other compounds in which may have questionable, or controversial support, IL-15 remains a candidate more likely to head the spotlight in anabolic research that doesn't involve hormones, or testosterone derivatives. Concern is mounting as many testosterone therapy clinics receive increasing scrutiny, and IL-15 is posed, quite reasonably as a powerful additive or alternative anabolic agent(14). 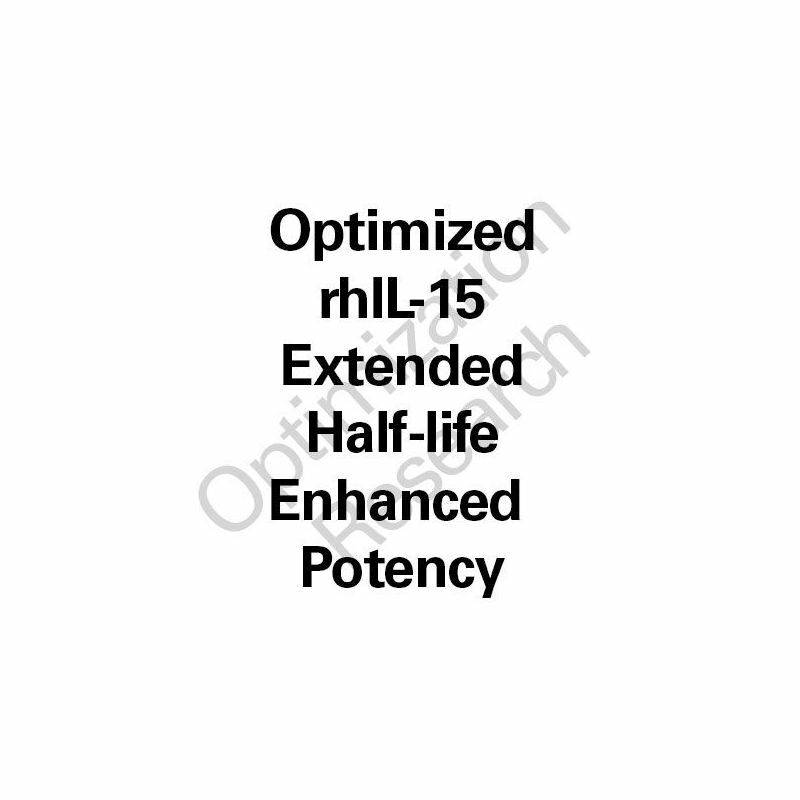 Despite all of these benefits, the half-life and bioavailability factors of ordinary IL-15; cause it to remain somewhat inferior to other compounds aiming to dominate the particular venue of interest. This then necessitates a need for an extensive modification in order for it to be plausible and significant in further scientific application and in practical use involving human subjects/volunteers(17) (18). 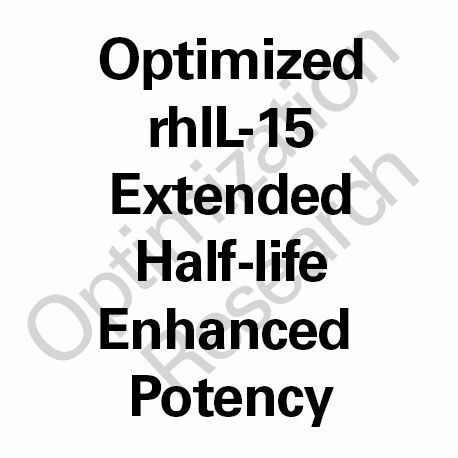 Modified and "Optimized" rhIL-15; code named MOD-rhIL-15 affords a proprietary modification that enhances it's potency by 125% and enhances the half-life by 190%.